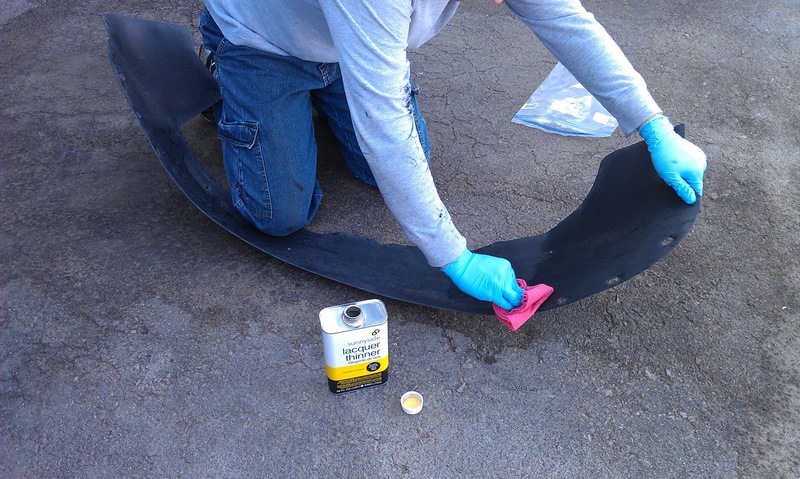 Jonathan prepped the gas tank heat shields with Prep and Ready. 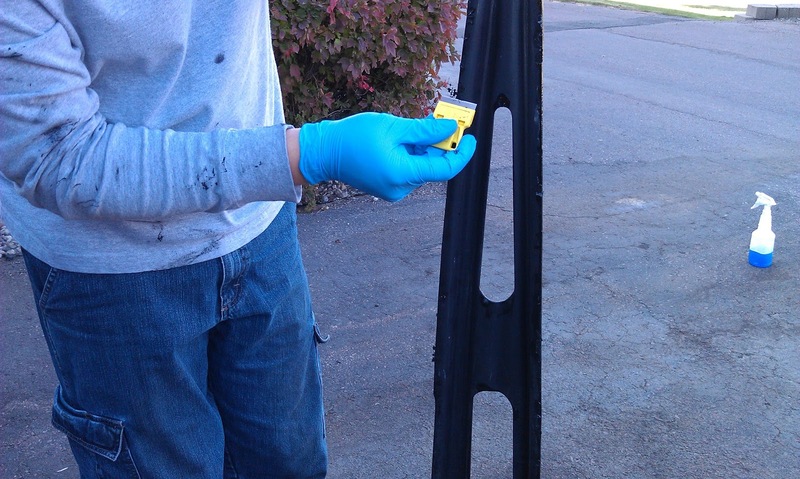 Jonathan used lacquer thinner to wipe down the surfaces to be painted on the fender well inserts. 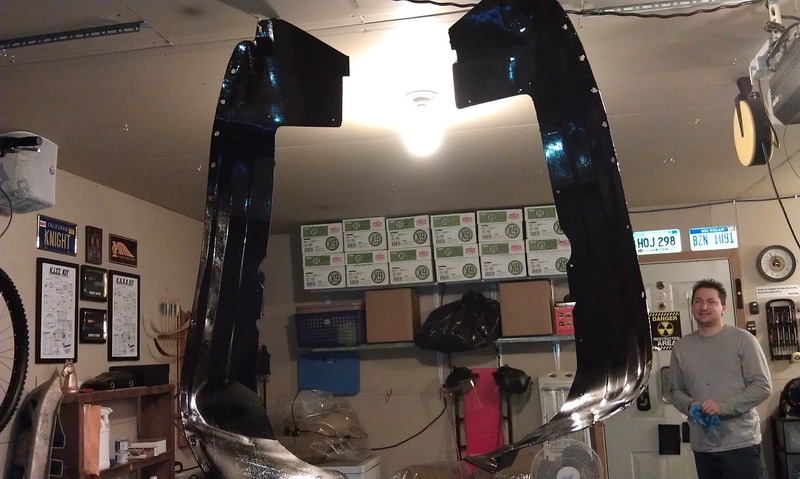 He is going to paint only the exposed side of the fender well inserts. This is for appearance only. I painted the front side of this with POR-15 a couple weeks ago. 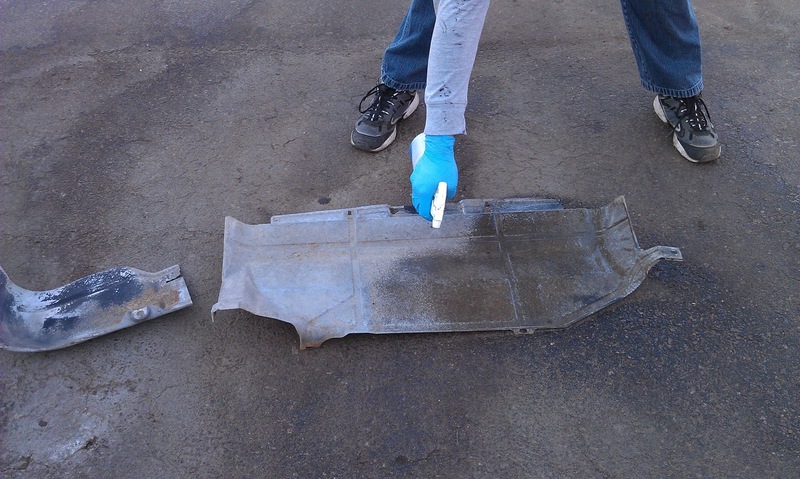 Jonathan used a razor-edged glass scraper to get the drips off the backside where the POR-15 had stuck to the tarp. 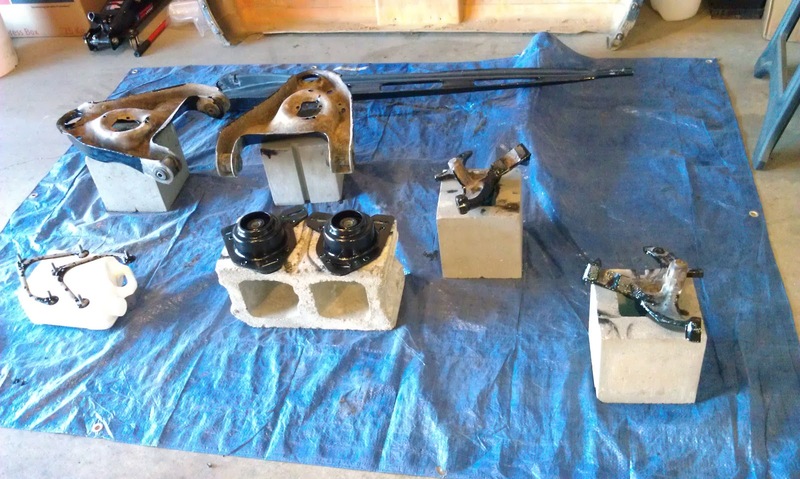 While he was doing that, I cleaned all the tools that were laying around the garage and put them away. I also swept the garage floor again. It is really nice outside again today but it is still kind of windy so leaves and dandelion seeds are blowing inside the garage. 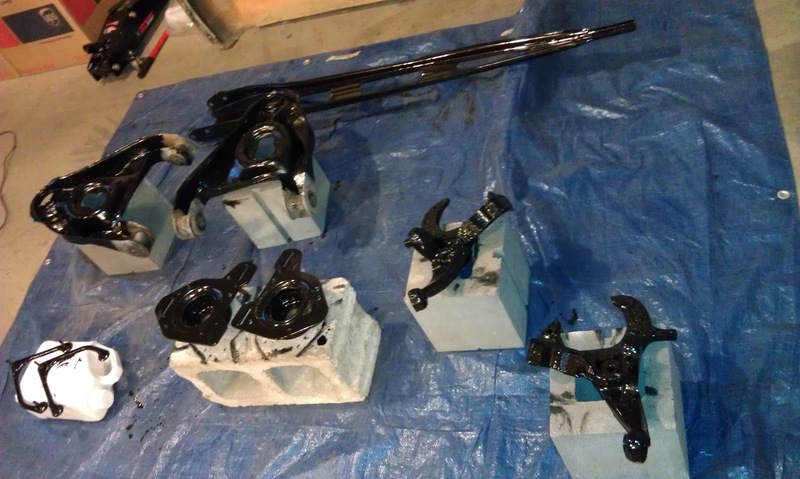 These are all the parts I painted with POR-15 a couple of weeks ago. Remember I only painted one side of them. I set them outside and Jonathan used the air compressor to blow off all the dust and dirt so I can paint the other side today. After Jonathan blew the dust off I set my Painting Stations up. 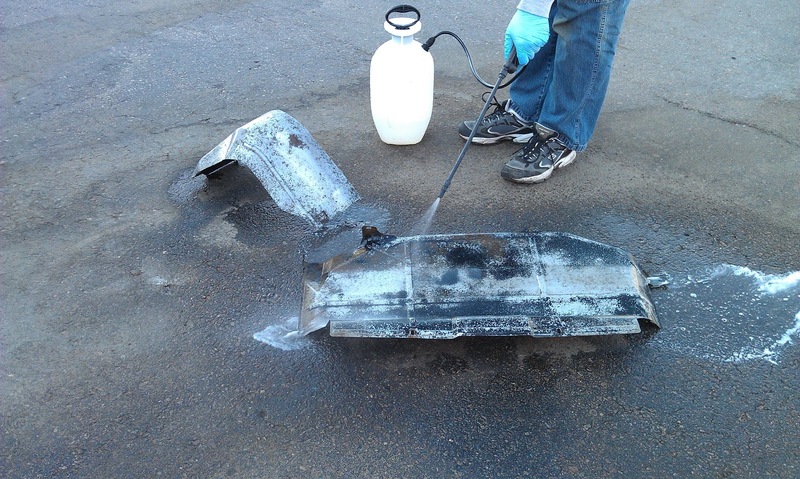 Jonathan kept the gas tank heat shields wet with Prep and Ready for 30 minutes and then rinsed them off with water. Here is the Painting Station Jonathan set up. 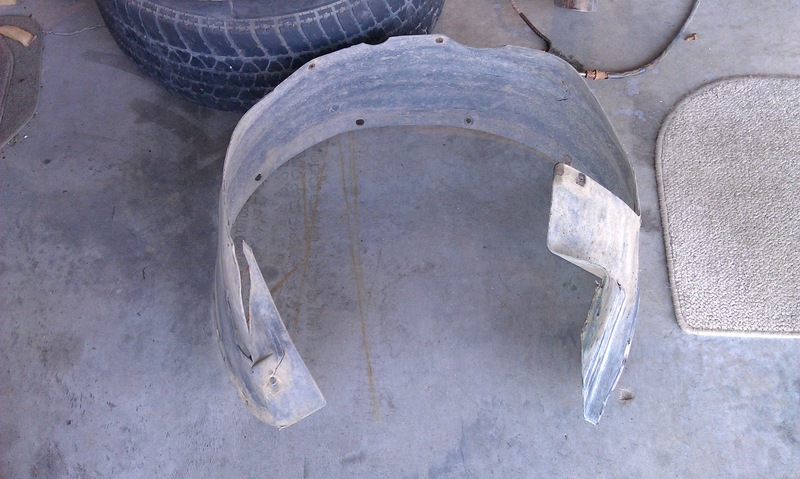 He put the fender up on saw horses with the old car mats underneath to protect the fender. 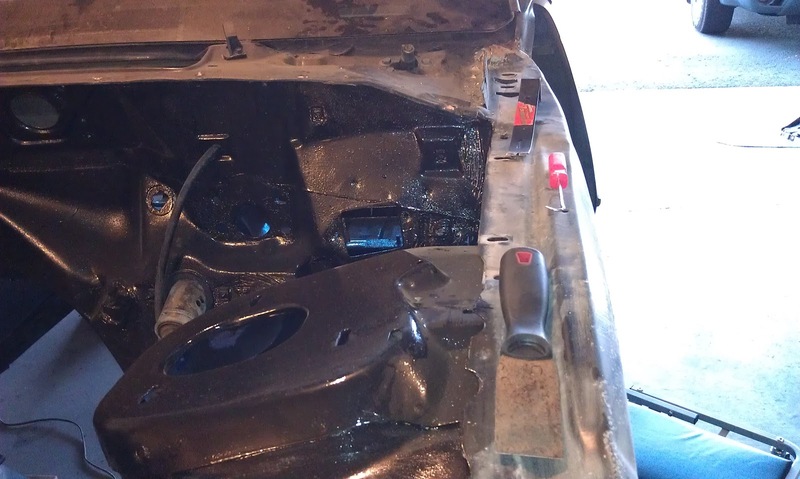 He originally was planning to paint the fender, the new fender well inserts and the gas tank heat shields today. 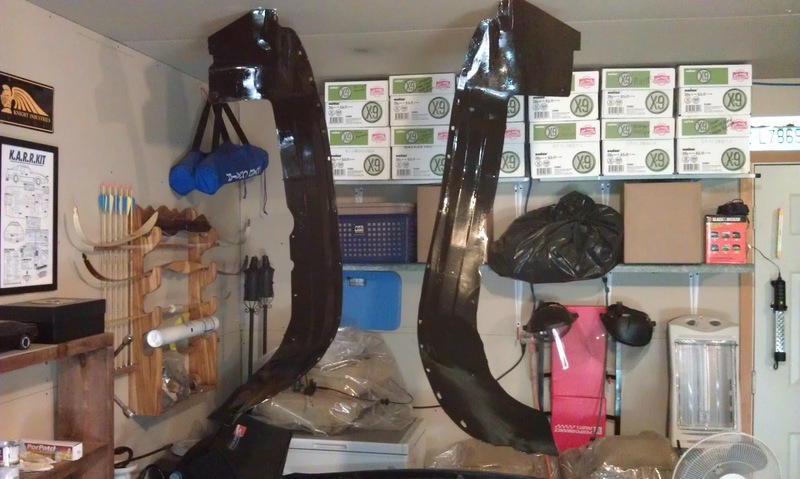 We only have 2 1/2 cans of POR-15 left though, so he decided to wait on the fender and just paint the fender well inserts and the gas tank heat shields. We need to order another six pack of POR-15. 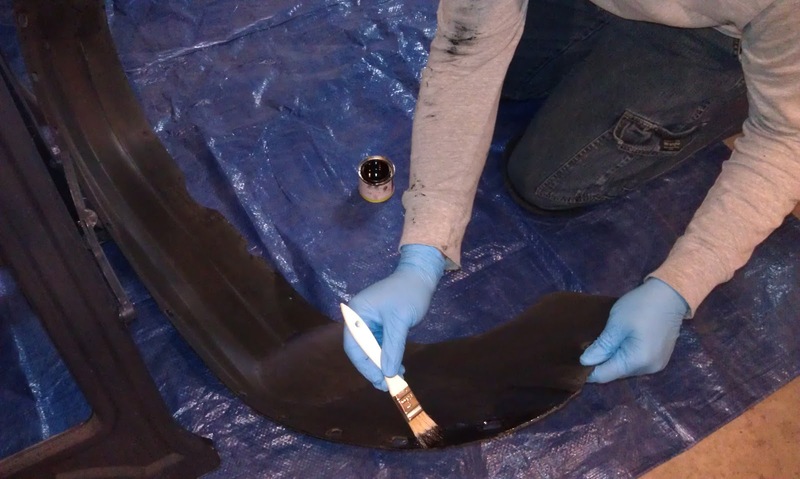 Here is Jonathan painting the first coat of POR-15 on the fender well inserts. Here are my parts after the first coat of POR-15. 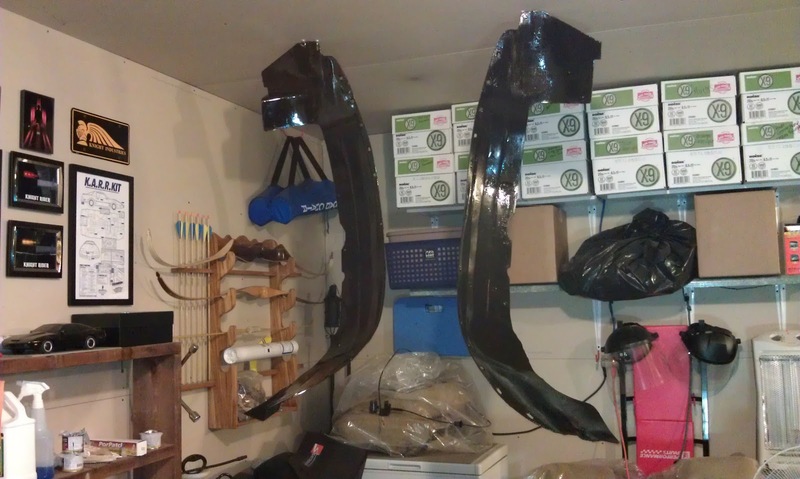 Here are the gas tank heat shields with one coat of POR-15. 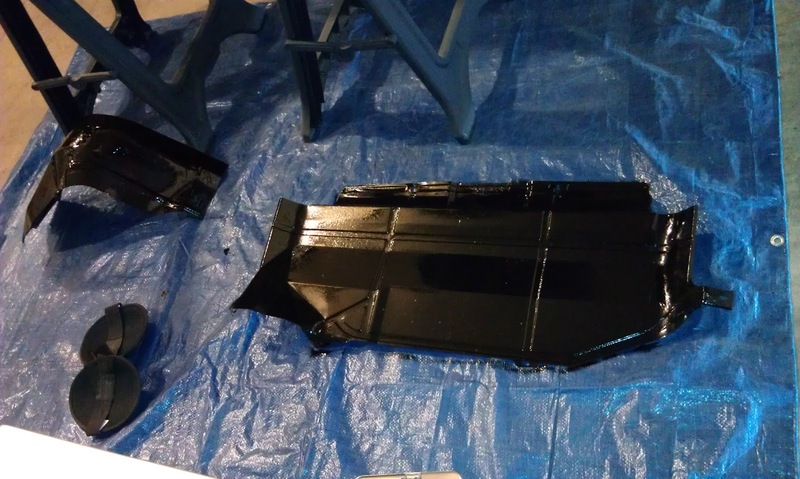 I helped Jonathan paint the larger heat shield. 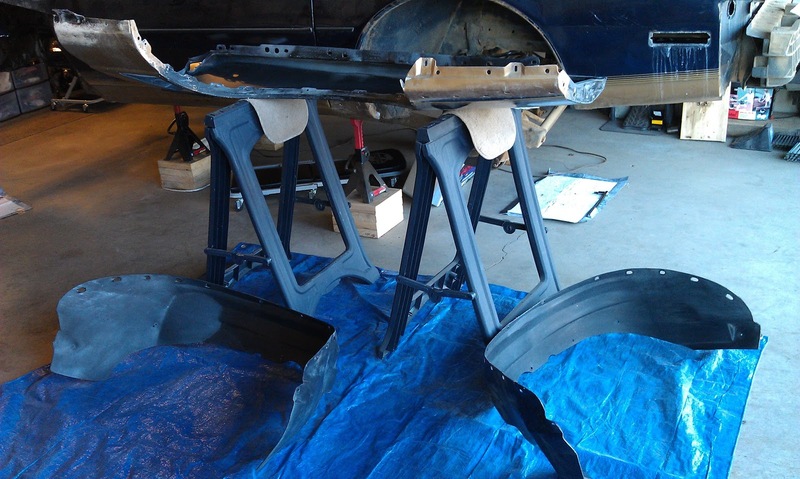 Here are the fender well inserts after Jonathan painted the first coat of POR-15 on them. Troy came over and helped Jonathan drop the rear end and gas tank. 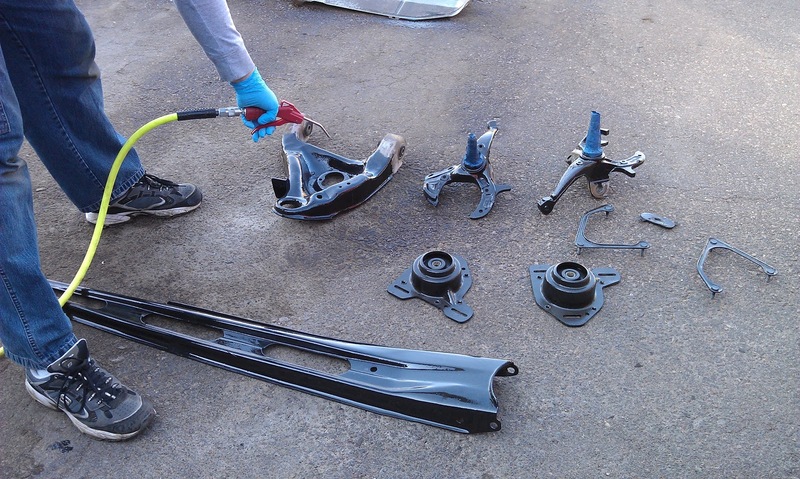 After he left we put another coat of POR-15 on all the parts. The garage door was open while the guys were dropping the rear end and gas tank, and a lot of dandelion seed and dust blew all over the garage. The first thing Jonathan did before we started painting again was attempt to blow the dust and seed off the parts with the air compressor. Blowing the parts off did not work as well as we had hoped, so we ended up wiping off each part with a blue shop towel before painting. This seemed to work okay. 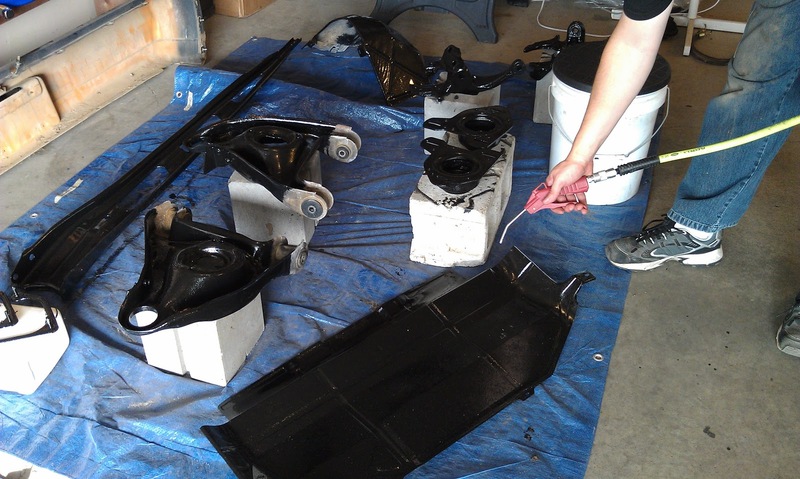 Here are the fender well inserts after Jonathan put a second coat of POR-15 on them. 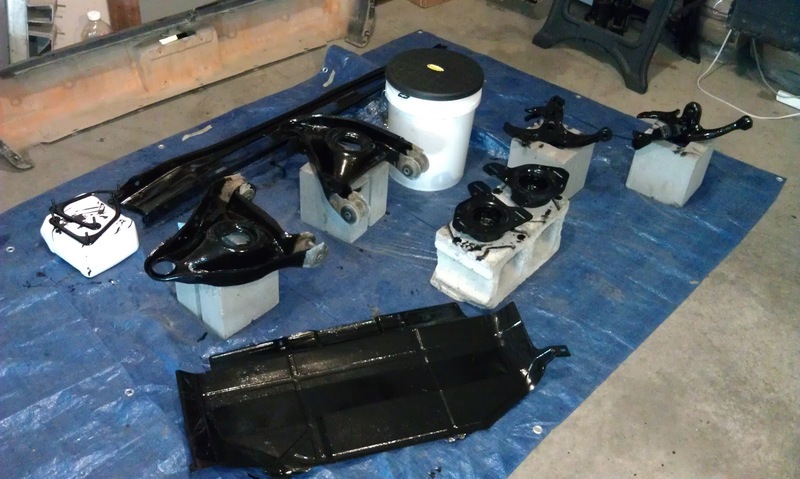 Here are my parts after their second coat of POR-15. 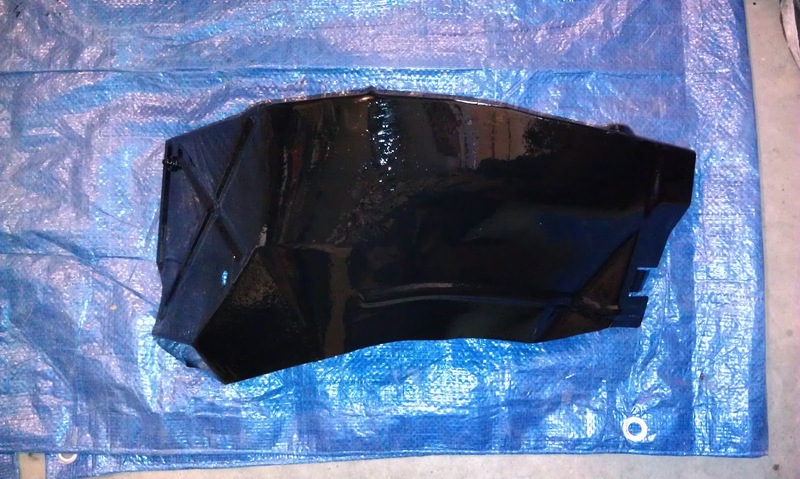 Gas tank heat shield with a second coat of POR-15. Jonathan painted this. We went out to the garage to apply the third and final coat of POR-15 at 9:00PM. 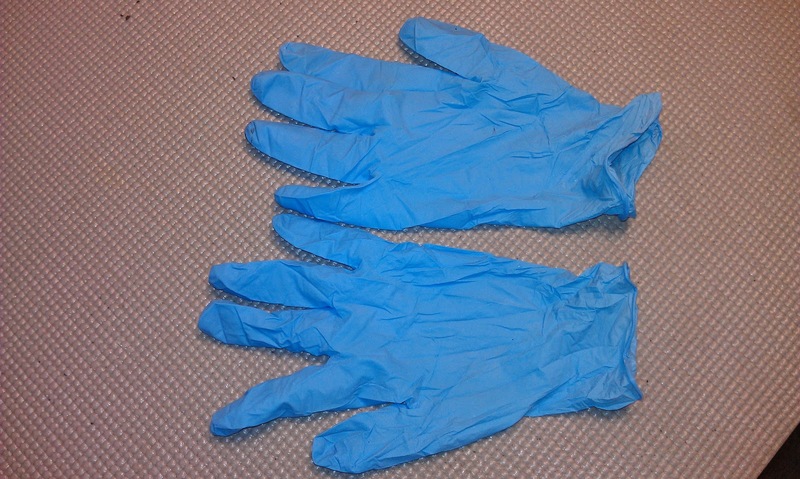 Here are my gloves after I finished painting. Notice they have no POR-15 on them. A record and an amazing feat, indeed! 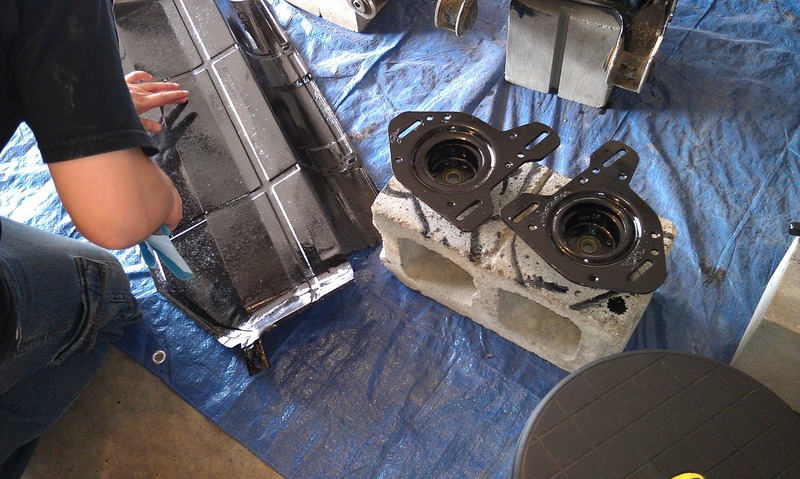 Here are Jonathan's fender well inserts with their third coat of POR-15. 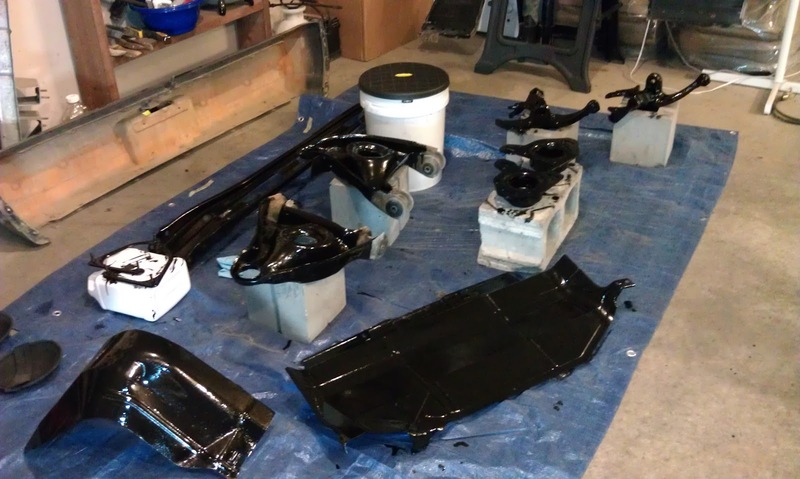 Everything has three coats of black POR-15 now. We are done for the night!